Last week I talked about how to build Private Label strategy through the category management foundations, with focus on topline category assessment results through market share, demographics and interaction data. As you might remember, Retailers need to ensure these profitable private label brands offer competitive differentiation by using the same strategic category management and fact-based approach for national brands and total category. This post, we are going to dive into private label pricing. When you analyze Private Label data, you can look at it in similar ways, whether it’s Nielsen or IRI or internal POS data. However, the breadth and depth of the data that you have available will impact the level of analysis that can be completed. If you have more than one Private Label brand, resist temptation to combine them into one brand. For example, don’t group “Generic” and “Private Label” together under one brand line in syndicated data. Instead, wherever possible, separate the two to capture significant (and sometimes surprising) differences between the multiple private label brands. In Homescan or Panel Data, you can break out Retailer Private Label brands (e.g. Great Value, Presidents Choice, etc.) in your data instead of grouping into a single “Private Label” — this separation provides a clearer perspective on the uniqueness of each brand. Further, it significantly increases insights derived from interaction data and consumer demographic data. Vendors/Manufacturers who can provide these types of unique insights to Retailers will add a value that most Retailers don’t have available in their data set. What’s Next? Price Gap Analysis. Now let’s review a simple but compelling price gap analysis that provides great insights into price gaps between Private Label brands and National Brands. Complete a price gap analysis to understand the impact that deep discounting on National Brands has on Private Label brands, and determine what the price gap threshold should be. Pricing analysis that determines what happens when a Private Label product is priced higher than the same size of National Brand. Retail pricing on Private Label brands vs National Brands is complex. In the example above, Retailer X has established that their product lineup in this category competes directly with one other National Brand competitor. They have completed a thorough 52-week price gap analysis to understand how they should be price positioning themselves vs their closest competitor. From their weekly pricing analysis, this Retailer has been able to identify the weeks where their Private Label products were priced higher than the National Brand, and the impact that pricing strategy had on their sales and profit for Private Label, as well as total category. On week 4, Private Label was priced $1.51 higher than the National Brand equivalent, and this week ranked 49th out of 52 weeks in both $ sales and profit for Private Label. On the same week, the National Brand product has its 5th top ranked week in $ and 2nd in profit, ultimately resulting in week 4 having the 11th highest $ volume week, and the 35th in profit. If you compare results across these weeks, you can see that in every instance, National Brand ranked high in both $ volume and profit for weeks (shown above with blue numbers), and Private Label ranked its worst weeks (shown above in red numbers). Some of these weeks worked favorably for total category sales and profit, while others did not. What should Retailer X do? In an example like this, Retailer X may want to establish guardrails, so that their Private Label is never priced above the National Brand equivalent, or only within a certain percentage. This could help to increase sales on aggressively priced weeks for National Brand, and increase profit as well. A keen understanding of price elasticity and cross elasticity needs to be done before adjusting any prices. 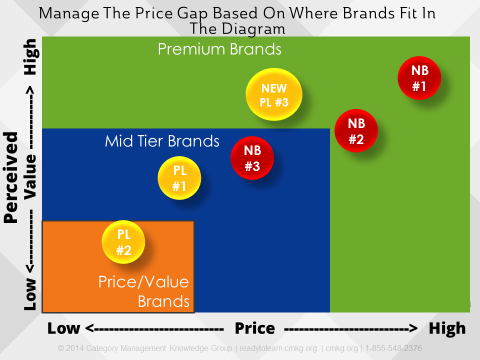 This will help Retailers understand the optimal price gap between National Brands and Private Label brands. A profit analysis may also help Retailers understand different pricing and promotional scenarios and determine the best ones for the category. Example #2: Compare average tonnage pricing to brand value perception. As already established, not all Private Label or National Brands are created equal, and the price gap between them needs to be considered. In the example above, I have graphed Price on the X axis, which should be a tonnage or equalized volume price, not average unit price, and Perceived Consumer Value on the Y axis. Of note, this is “value” based on consumer perspective, not based on where the Retailer or Manufacturer/Vendor wants their brands. This “value” is gathered through focus groups and consumer studies. The mid Private Label brand (PL#1), which is lower in price, with a mid to low perceived consumer value. Next is our generic label, or PL#2. It is low priced and lower perceived value. Remember that these two brands interact, so if PL#1’s pricegap is too high, consumers may switch to the lower priced generic brand. NB#1 is high perceived value and high price – recall that this brand had little interaction with either private label brand. This is because their value is so much higher, and consumers are willing to pay the higher price for this value. NB#2 is much higher in price, but the perceived value isn’t all that far from PL#1. If the gap gets too high between these two brands, consumers will trade down to PL#1, and if it gets too low, consumers will trade up to NB#2. Finally, NB#3 is similar perceived value to PL#1, and higher priced. Recall that it strongly interacts with both private label brands. So it’s in a vulnerable position. If the pricegap gets too high, consumers will trade down to one of the private label brands. Because there is no real perceived value difference, this manufacturer needs to determine how to differentiate itself more from the private label brand. Imagine if this Retailer launched a 3rd private label brand, with higher perceived value than NB#2 and just below NB#1. This will put both NB#1 and NB#2 in jeopardy. Generally, when a Private Label cuts their price it will have little impact on the National Brands. 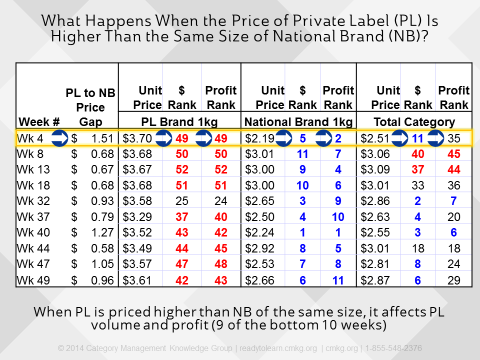 However, if the National Brand is close to a Private Label Brand, as in PL#1 and NB#3, a relatively small price cut can result in significant gains. Further, if National Brands are far away from Private Label Brands in both perceived value and price, even a large price discount will not have a significant impact on Private Label sales. Private Label pricing analysis is a valuable exercise for both Retailers and Manufacturers/Vendors. It helps each understand the interaction between Private Label and National Brands at different pricepoints, and helps them consider how these interactions affect total category sales and profit. So don’t forget to include Private Label as part of any category analysis and development of true category solutions. Not sure how to complete this type of analysis? Category Management Knowledge Group can teach you how to complete foundational to advanced analysis through category management training that will help you to make more strategic decisions for your Private Label brands.